Google just announced that some of features in Google Docs and many other Google Sites and Services wont be available over Internet Explorer 6 and it made a big buzz across the blogs that Google made the final push to let this browser die, which still was holding more market share than chrome, IE7 or IE8, around 21% till the last December 2009. Sure the link goes to the recent hacking incident, which was officially done with exploiting flaws in IE6, for which Microsoft later on released security fixes as well. Still many security experts and companies taken stand against Internet Explorer 6. German Government even issued advice to all of its citizens for not using any version of Internet Explorer including even the recent one Internet Explorer 8. Is it really so that only that hacking incident made IE6 pushed away? I don’t think so. Introduction of HTML5 has already pushed IE6 to become obsolete as Internet Explorer till its version 7 didn’t supported HTML5 and like Google sites, many of leading sites have already moved over HTML5 due to availability of wide range of more options. 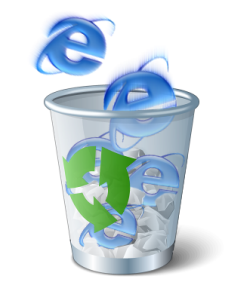 Like Google Gears, many of the services already started mentioning that you can’t use them from IE6. Its just this, Google Docs have became of huge importance in world of cloud computing and by ruling out IE6 shares in it, Google has made it somewhat helpless by now (very few can keep and actively use multiple web browsers). Internet Explorer 6 was released on August 27, 2001, a few months before Windows XP. This version included DHTML enhancements, content restricted inline frames, and partial support of CSS level 1, DOM level 1 and SMIL 2.0. The MSXML engine was also updated to version 3.0. Other new features included a new version of the Internet Explorer Administration Kit (IEAK), Media bar, Windows Messenger integration, fault collection, automatic image resizing, P3P, and a new look-and-feel that was in line with the Luna visual style of Windows XP, when used in Windows XP. Internet Explorer 6.0 SP1 offered several security enhancements and coincided with XP SP1 patch release. In 2002, the Gopher protocol was disabled and support for it was dropped in Internet Explorer 7. Internet Explorer 6.0 SV1 came out August 6, 2004 for Windows XP SP2 and offered various security enhancements and new color buttons on the user interface. IE6 updated the original ‘blue e’ logo to a lighter blue and more 3D look. The biggest reason behind the success of Internet Explorer 6, it was shipped with kind of most successful operating system till now, so if the OS was a hit, so was the perfectly working browser Internet Explorer 6. Later as tabbed browsing became more successful and people started shifting to firefox more, Microsoft pushed Internet Explorer 7 with their Windows Vista, but many experienced it slower than even IE6 and was not that well received. Microsoft still hoping the best to get its shares back with a much better Internet Explorer 8. I expect more services to come forward to drop support with Internet Explorer 6 in next few days as few already done the same from behind silently. As I read in Devilsworkshop.org as well, is Gmail going to drop support for IE6 in next? Previous Previous post: Apple iPad: Are we really running?